Macronutrients and micronutrients aren’t just of interest to bodybuilders and athletes, a fact that Steven Pennings, Moores Professor of Biology and director of the University of Houston Coastal Center, can attest to. 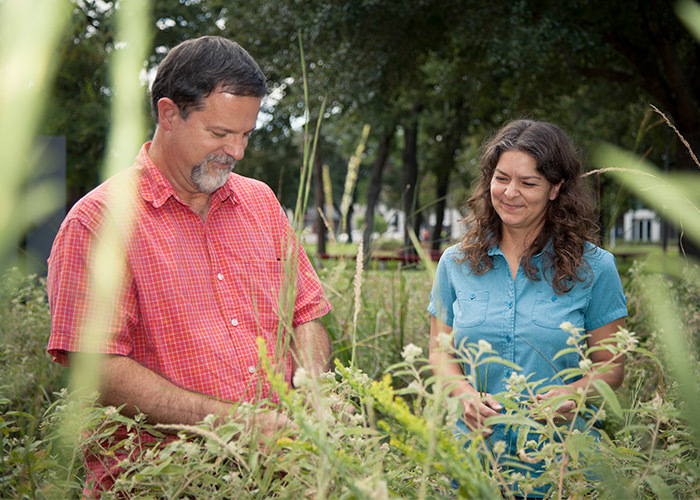 Director of the UH Coastal Center Steven Pennings and postdoctoral researcher Angela Laws.One of Pennings’ research projects examines the role of soil micronutrient concentrations in prairie herbivore communities, which include species of insects such as grasshoppers and aphids. To study this effect, Pennings and his collaborators have set up a large field study at the UH Coastal Center, which was designated by the Texas legislature as the Texas Institute for Coastal Prairie Research and Education. Pennings’ project, which is in collaboration with postdoctoral researcher Angela Laws and University of Dayton faculty member Chelse Prather, is comprised of 16 separate treatments, on plots that are 30 meters by 30 meters. For each individual treatment, there are 8 replicate plots. Each plot receives a combination of the macronutrients nitrogen and phosphorus and the micronutrients sodium, potassium and calcium. These different treatments mimic conditions found in nature, where some areas will have higher or lower concentrations of nutrients. “We are the first controlled study to examine the effect of micronutrients on herbivore populations,” Pennings said. This field study assesses changes in herbivore populations in the different plots. One reason for changes could be that micronutrients affect the food source, either by increasing the total mass of plants growing, or the type of plants growing. Another reason could be that the presence of specific micronutrients affect the health of the herbivores themselves. “To disentangle these effects, we’ll follow the field study with laboratory experiments,” Pennings said. The Coastal Center, which can be found just off Interstate 45 South, a few miles before the bridge to Galveston Island, contains a rare treasure: 300 acres of threatened coastal tallgrass prairie. Coastal prairie once extended along the coast, from Corpus Christi to Louisiana, with an estimated 6.5 million acres of habitat in Texas. Today, less than one-tenth of one percent of undisturbed coastal prairie grass remains, with the remaining 99.9 percent eliminated due to agriculture and development. “The fact that the Coastal Center is managed by a university makes it conducive for research to take place,” Pennings said.